The first Romanians to settle in the Warren area came here around 1905. They were attracted to this area by the fast-growing economy and industrial expansion going on at that time. Warren seemed to hold the answer to their reasons for leaving Romania and coming to America, mainly “to save a thousand dollars and return fare to Romania.” A majority of the people who emigrated to this area came from the Transylvania section of Europe, which at that time was under the Austro-Hungarian rule. For the most part, those emigrating to these shores were young men and to a lesser degree young women anxious to improve their lot in life. By 1912, a sizable group of these Romanians had settled in the Warren area due to the availability of employment in the local factories. They came and established resi­dence in the boarding houses run by other Romanians . This lifestyle allowed them to be among their own, they spoke the same language, ate food they were familiar with, and socialized with each other. This living and working situation resulted in their desire to expand their social and cultural activities and in 1912 they formed a social and beneficial society called the Biruinta Society. The majority of the new arrivals were baptized Orthodox and having solved their social needs decided to do something to meet their spiritual needs. Father John Podea, Administrator of the newly formed Romanian Orthodox Youngstown Deanery, was contacted and asked for his assistance. Under the direction of Father Podea, the people elected officers and a council which was divided into teams to contact all the Roma­nians in the area for solicitation of funds to build the proposed church. Over $10,000.00 was collected in a relatively short time and the new council purchased a lot on Vine Avenue, contacted an archi­tect and arranged financing through a local bank. On October 16, 1918, the new church was completed and consecrated. The total cost was approximately $20,000.00, plus the interior furnishings which were donated by the people. The mortgage of $10,000.00 was paid off by 1923, five years after its inception. In 1934, after extensive renovation both inside and out, the Church was rededicated by Archpriest and Vicar Father John Trutza and visiting priests. In 1965, due to a lack of space and urban renewal, the parish found themselves looking for a site to relocate and build a new church. Two lots on North Road were purchased and the necessary financial arrangements were made through the Second National Bank. Architects Wachter and McCelland were hired to draw plans for the new church and parish home. Baker Construction Company was awarded the contract for the church and Hank Brothers Construction of Howland was given the contract for the parish home. The year 1967 was a transitional year in the life of the parish. The parish home was completed in the Spring, and the foundation and framework for the church was in place. 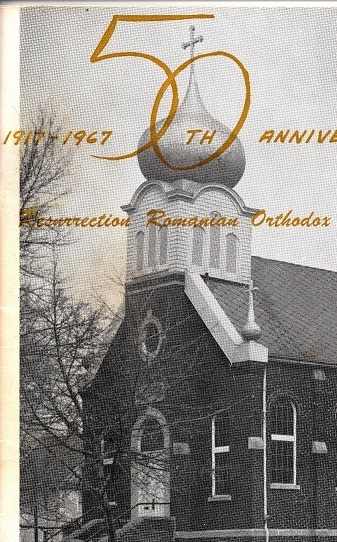 The parish celebrated its 50th Anniversary in the church on Vine Avenue on May 6 and May7, with services pontificated by His Grace Bishop Valerian, and the last Divine Liturgy was celebrated in the old church on Sunday, No­vember 26, 1967. A temporary altar was set up in the newly com­pleted Social Hall and the first Divine Liturgy was celebrated on De­cember 3. The year 1968 saw the new church completed and the building was consecrated on May 5 by Bishop Valerian, assisted by a number of clergy from the Episcopate. An era had passed and a new begin­ning was in the making. In the years following our move into the new Church, the parish family was faced with many challenges, the foremost being the pay­ment of the mortgage and generation of operating expenses for the new and expanded church complex. The solution to these needs were met by the formation of a catering service which was staffed by parishioners and operated out of the Social Hall. This solution proved to be very successful and through many, many hours of de­votion and hard work, enough funds were generated to pay off the mortgage and set aside operating expenses. A Mortgage Burning Ceremony was held on October 28, 1973. A major accomplishment achieved in five years. Holy Resurrection has participated in many functions sponsored by the Romanian Orthodox Episcopate of America, and has hosted the national conventions of A.F.O.R.A., AROY, the Brotherhood and the annual Episcopate Church Congress at the Vatra. They are also active in religious and civic affairs on the local level. While respecting the culture of our ancestors, our parish endeav­ors to be a spiritual haven for all persons seeking the path of salva­tion through the Holy Orthodox Church.